What would education look like if every child were read aloud to for 15 minutes every day? Are you a parent? A care-giver and/or concerned citizen? Join the effort. Take the challenge. Share your thoughts and experiences. But most importantly, commit to reading aloud for 15 minutes every day to a child or children in your care. This unprecedented effort will unite diverse groups that touch the lives of children from birth to age 8 under its single, powerful message – Read Aloud 15 MINUTES. Every child. Every parent. Every day. Read Aloud 15 MINUTES’ goal is to have every child being read aloud to by a parent or loved one for 15 minutes every day starting at birth. The decade-long 15 MINUTES Movement will be a massive public awareness effort, spearheaded by partners in cities throughout the nation that will rally grassroots support through local awareness efforts and community outreach. Read Aloud partners are united behind the idea that 15 minutes of daily reading aloud from birth to age 8 can change the face of education, nationally. · Reading aloud is the single most important thing a parent or caregiver can do to help a child prepare for reading and learning. · Nationally, 37% of children arrive in kindergarten without the skills necessary to begin their learning journey. · If a child is not reading at grade level by the end of the first grade, then there is an 88% probability the child will not be reading at grade level by the end of the fourth grade. · Even in higher-income households, nearly 40% of families do not read aloud every day. · More than half the children in this country - 13 million children - will not hear a bedtime story tonight. For our loyal readers, you know how important reading is to us. We are so happy to partner with the read aloud program. 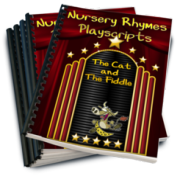 We're certain you will find many resources here on the pages of nursery-rhymes-fun.com to help with your goals. You might find some more suggestions here. And of course, what better place to start than with a Bedtime Story. But don't forget our Chapter Books are great too!